Your pet brings you so much joy! They greet you when you get home from work and snuggle with you when you fall asleep on the couch. But pets also come with a downside – pet hair. If you don’t have the right vacuum, it can be impossible to effectively clean up all of your pet’s hair. We hope that with our guide you will be able to find the right vacuum to clean up after your pet. In this article, you will find a Buyer’s Guide on vacuums for pet hair, FAQ on vacuums for pet hair, and some in-depth reviews of the best vacuums for pet hair on the market. Keep reading to learn everything you need to know about vacuuming up your pet’s hair. What Should You Look for in a Vacuum for Pet Hair? 1 What Should You Look for in a Vacuum for Pet Hair? 1.4 Will You Need to Vacuum a Staircase? 1.5 How Will the Vacuum Perform with Other Debris? 1.6 Does it Have Special Features to Help with Your Pet Hair Needs? 3.1 Should I Get a Vacuum with a Bag? Or Go Bagless? 3.2 What Vacuum Should I Look for if My Home is Mostly Carpet? 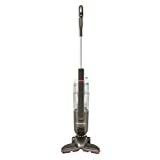 3.3 What Vacuum Should I Look for if My Home is Mostly Hard Floors? 3.4 My Home is a Mix of Hard Floors and Carpet, What Should I Do? 3.5 I Have Bad Allergies – Is there a Vacuum for Me? 3.6 What Can I Do about Pet Odor? 3.7 My Pet is Scared of Vacuums, Especially the Loud Noises. Is there Anything I Can Do? Looking for the right vacuum isn’t easy. Once you add pet hair to the mix, the job can be even more difficult. Below, we’ve written up some guiding questions you should ask yourself when shopping for a new vacuum. It’s important that you find a vacuum that is the right weight for you. You don’t want vacuuming to turn into a workout! Vacuum weight can vary significantly, so much sure you consider how much weight you’re willing to push around when vacuuming. Vacuums can be quite large or small and compact. You’ll want to consider how much space you have to store your vacuum before selecting a model. If you are in an apartment with limited storage, a smaller vacuum is probably your best option. Have a house with plenty of room? Perhaps a larger vacuum will suit your needs and still fit comfortably in your home. It’s essential to decide how much you want to spend on your vacuum from the beginning. Vacuums can run from more standard, budget-friendly prices to high-priced more designer models. Your goal should be to maximize your ROI. Why spend hundreds of extra dollars on a model that barely does more than lower-priced counterparts? Will You Need to Vacuum a Staircase? Stairs can make or break your experience with your vacuum. They can be tricky to navigate, and some vacuums simply don’t maneuver well enough to clean them properly. Make sure your new vacuum is effective on stairways before you buy it. If it’s difficult to maneuver, and you have stairs, you may want to consider a different option. How Will the Vacuum Perform with Other Debris? Keep in mind that you’ll need your vacuum to pick up all the debris in your carpet, not just the pet hair. I live next to a construction site, so I need a vacuum that can pick up all the dust that comes in through the window. Be sure to keep your specific circumstances in mind . Do you have kids? Do you work outdoors? These are important things to consider when vacuum shopping. Does it Have Special Features to Help with Your Pet Hair Needs? Of course, the most important thing to look for in your vacuum is whether or not it can effectively pick up pet hair. Many vacuum models are made specifically to handle pet hair. Some vacuums will include a special nozzle or an extra basket where the pet hair is stored. You’ll want to be sure that your pet hair vacuum contains the accessories you need to clean your home. Below you will find a list of the nine best vacuums for pet hair with an in-depth review of each. All of these vacuums performed well in our tests, and we would recommend any one of these models. The Hoover WindTunnel T-Series Pet Rewind Upright is a bagless, corded upright vacuum that is made specifically to clean up after your pet. This vacuum weighs just under 18 pounds , meaning it is a very sturdy machine. However, it is one of the heavier vacuums on our list which is something to consider if you prefer a lighter model. One of our favorite things about the Hoover WindTunnel Pet Rewind is its Cord Rewind feature for the 25’ cord. All you have to do is tap the pedal, and the cord retracts itself! No more chasing after the cord while you vacuum. It also features a HEPA Media Filter, great for trapping all your extra debris, and perfect for those of you who may suffer from allergies. We love that this vacuum includes an indicator feature, so you always know when it’s time to clean out the hose. This is also a particularly quiet model and will help keep your pet calm while you clean. Check out this vacuum in action to decide if it’s the right machine for you and your pets. The Hoover Linx Cordless Stick Vacuum Cleaner is a super light-weight option that is highly effective at cleaning up pet hair. It features the LINX Cordless Fade-Free Lithium-Ion Battery System. This interchangeable battery system means you never have to sit around and wait for the battery to charge, and can instead use the vacuum whenever you’re ready. An exciting feature of this vacuum is the WindTunnel Technology. With this technology, your vacuum will effectively lift both surface debris and dirt deeply embedded in your carpet. If your home has both hard floors and carpet, then this vacuum will work well for your needs. It includes Multi-Floor Cleaning, and easily transitions across surfaces for an effective clean. If you’re vacuuming a lot of space at once, you can use the vacuums Fuel Gauge to keep track of the machine’s battery life. This way you always know when it’s time to change the battery. Additionally, because this vacuum is a cordless stick model, it is quite narrow and easy to store, making it a great option for those with limited storage space. Edge Cleaning Bristles – These bristles make sure the pet hair is removed from your floor and is great at getting to those hard-to-reach areas. Extreme Recline Handle – This handle allows your vacuum to go underneath furniture and pick up pet hair that may have settled under your bed, couch, or tables. The Hoover Linx Cordless Stick Vacuum comes with a two-year warranty. It is easy to assemble and moves effortlessly around the house, cleaning along the edges of rooms and the stairs. Consider this Hoover if you’re looking for a cordless model to pick up your pet’s hair. The Bissell PowerEdge Pet Hardwood Floor Vacuum is a bagless, stick model vacuum. This is an amazing budget-friendly vacuum. This Bissell is thin and easy to store in even the smallest of spaces. It is also made specifically for cleaning pet hair up from your hard surfaced floors . If you are a pet owner with mostly hardwoods, this is a fantastic option for you. The Bissell PowerEdge Pet can pick up debris along the edges of your home and built to work well in small spaces. You won’t need any attachments or extra brooms to reach the corners of your home. The vacuum is bagless and comes with a dirt cup that is super easy to empty and clean up, meaning you don’t have to worry about dust flying everywhere. Most interestingly, this vacuum comes in a V shape, which navigates large debris into the center suction path of the vacuum. The ends of the “V” will capture smaller debris. The Bissell comes with a 20-foot power cord and cleans an 11.35-inch cleaning path. The swivel head means you can clean around corners and furniture legs. The Bissell PowerEdge Pet Hardwood Floor Vacuum has amazing suction for its size. When you consider the V-Shaped vacuum head, this machine certainly has a “wow” factor. For those with mostly hard-surfaced floors, I’d give this vacuum some serious consideration. The Bissell Pet Hair Eraser Handheld Vacuum is an incredibly affordable handheld option for cleaning up your pet’s hair. This handheld vacuum is only five pounds, easy to grab and use anytime. You can use the Bissell Pet Hair Handheld on upholstery, stairs, and hard surfaces. It even works on cleaning up pet hair in your car. This vacuum comes with a 16-foot power cord and contains a dirt cup capacity of 0.78 Liters. This is a bagless model, so there’s no need to replace expensive bags. This handheld vacuum can pick up debris both large and small and is excellent at sucking up cat litter and pet food. It comes with two nozzles that you can change out as needed. These nozzles make the vacuum incredibly versatile. This vacuum is small, compact, and highly portable. You can store it anywhere in your home or can take it with you in the car. It features an easy-grip handle that is comfortable to hold. The vacuum can be turned on and off with the touch of your fingertip. Where this vacuum shines is removing pet hair from your furniture. Multi-level filtration that will clean up pet hair while also reducing allergens in your home. If you’re looking for a small, compact handheld vacuum than the Bissell Pet Hair Eraser Handheld vacuum is truly a phenomenal choice. It is a very powerful option. Although it may not be the best for hardwood floors, it works pretty much everywhere else. The Eureka Mighty Mite Canister Vacuum cleaner is a corded option that’s fantastic for quick and efficient cleaning. Canister vacuums tend to be more powerful options than uprights, as there is no limit on the size of the vacuums engine. They also tend to have superior suction, making them a quick and easy way to clean up stubborn pet hair. This vacuum works effectively in your home or your car. It is relatively lightweight for a canister vacuum, weighing in at less than nine pounds. This vacuum is easy to carry and transport from room to room. It is ideal for safely cleaning hard floor surfaces. The Eureka also does well on harder-to-clean floors like rugs or carpets. The Eureka Mighty Might has a super long cord that measures 20 feet , meaning you won’t have to move it too much to clean an entire room. There is a special cord storage spot on the vacuum, so there is no tripping over your vacuum’s cord. The Power-Touch handle includes fingertip control, so it’s easy to switch on and off. This vacuum’s 12 Amp motor makes it a powerful option for your home. You can pick up fine debris as easily as larger dirt. These vacuums are made to last, and some reviewers have even mentioned that they’ve had the Eureka for well over ten years. 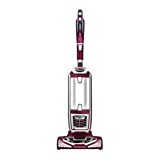 The Hoover T-Series WindTunnel Pet Vacuum is an option from Hoover that includes both a bag and a cord. The bag includes on-touch bag door release which makes it super easy to empty out the bag when it gets full. The cord extends to 30 feet. You can use this vacuum in multiple rooms without having to unplug it. If you have allergies, this vacuum is an excellent option. It included an Activated Carbon HEPA Media Bag filter that traps nearly 100% of dust and pollens, helping you feel healthy in your home. It also includes fingertip controls located right on the handle. The 5-position height adjustment knob means you can change the brusholl’s settings to accommodate your carpet. We know most homes have both hard surface floors and carpeting and it seems that Hoover has prepared for it. The Hoover T-Series WindTunnel Pet Vacuum includes a Brushroll that can be taken on and off. “On” for when you’re cleaning your carpet and “off” for when you need a gentler clean on your home’s hardwood floors and tile. Every single Hoover WindTunnel Pet Vacuum includes an air-powered hand tool that helps you reach the corners and crevices of your home. There is also a bag-check indicator, so you never have to wonder when it’s time to change out the bag. The Shark Rotator Powered Lift-Away True Pet Vacuum is an excellent upright option. The vacuum includes a canister that can be attached or detached. This way you can attain a deep enough clean while still managing to get to those hard-to-reach areas. It also includes Shark’s Anti-Allergen Complete Seal Technology and a HEPA filter , so its great for allergy sufferers. Like the last Shark model on our list, this vacuum featured Shark’s Hard Floor Hero technology. Another bonus is the fingertip controls, which allow you to switch seamlessly from Hard Floor to Carpet Mode. The Shark Rotator Powered Lift-Away is a great option for those with both hard-surface floors and carpeting in their home. One special feature of this vacuum is the LED lights. These allow you to navigate around dark corners and under furniture. With the LED lights you can see every bit of dirt you might have been missing before. The vacuum also has Dynamic Swivel Steering which provides amazing control while you vacuum around furniture and other obstacles in your home. TruePet Motorized Brush – this brush contains all the power of your upright vacuum but is small. It can catch even the most difficult pet hair and is effective on carpet, upholstery, and even inside pillows. Pet Multi-Tool – This is two tools in one, including a stiff bristle brush that can get to difficult debris and is amazing for getting up the most stubborn pet hair. As a bonus, the Shark Rotator Powered Lift-Away True Pet Vacuum is sleek and nice looking. This vacuum comes with an excellent color scheme. The Eureka AirSpeed ONE is a bagless upright vacuum weighing in at eight-pound sand containing ten amps of power. This vacuum is very lightweight, making it an excellent option for those who do not want a heavy vacuum. It features a highly efficient air path that allows air to pass directly through the vacuum, decreasing the space dirt has to travel. This vacuum comes with a 29-foot cord and covers a 13-inch cleaning path . With these features, you can move from room to room without unplugging your vacuum. It also includes a multi-cyclonic system that keeps fine dust separated from large dirt and debris. This vacuum is bagless but includes a Washable Dust Cup Filter that only requires occasional replacement. The Eureka AirSpeed ONE also contains a Scuff Resistant Furniture Guard that is made to protect the furniture in your home. It holds 1.25 dry quarts of dust and includes an extension wand for cleaning walls and ceilings. This vacuum comes with a two-year warranty and has five different height adjustments so it can be accommodated for your carpet. This is an excellent option for those with pets who also want a lightweight vacuum. The most impressive feature of the Shark Navigator Lift-Away Professional is Shark’s patented Lift-Away® technology. All you have to do is press a button, and the canister lifts away, making it easy for you to clean the corners and crevasses of your home. The Lift-Away feature makes the Shark is great for cleaning stairs, blinds, and ceilings . This vacuum is essentially an upright and a canister all in one. This vacuum includes Hard Floor Hero™ which means it is specifically made to pick up debris from your hard floors. It is also a perfect option for those with allergies and includes a HEPA filter as well as Shark’s Anti-Allergen Complete Seal Technology®. At only 13.7 pounds it is a lightweight but powerful option to clean your floors. If your home contains a mix of hardwoods, carpet, and tile this vacuum can clean each surface. You can turn the Brushroll on for cleaning your carpet. When you move to your hard floors, take advantage of the Brushroll Shutoff, which allows you to clean your bare floors gently. This vacuum holds 2.2 dry quarts of dust its cleaning path is nearly 10 inches wide. This vacuum is one of the absolute best for picking up your pet’s hair. The Shark picks the hair right up, and it goes directly into the canister. It won’t even get stuck in the brush, a common frustration when cleaning pet hair. It’s normal to have some questions before you purchase your vacuum. Having pets makes your circumstances unique, and you want to make the right choice before you buy. See below for some Frequently Asked Questions on vacuums for pet owners. Should I Get a Vacuum with a Bag? Or Go Bagless? Vacuums with and without bags have their advantages. Skipping the bag will save you some money, as you won’t have to purchase new bags over time. However, vacuums with bags help minimize the dust released into the air and usually come with an indicator that tells you when it’s time to empty your bag. What Vacuum Should I Look for if My Home is Mostly Carpet? If your home is mostly carpet, you are going to want a vacuum with plenty of suction. Carpet can be harder to clean, and you want your vacuum to be powerful. You’ll also want a vacuum with a brush roll, which helps ensure the suction is effective. It is a bonus if your vacuum’s suction and height are adjustable so you can tailor it to your specific needs. What Vacuum Should I Look for if My Home is Mostly Hard Floors? The good news is that if your home is mostly hard floors, it will be much easier for you to clean up after your pet. You’ll want to go for a powerful vacuum. Aim for an upright or canister to get your floors clean. For hard floors, you may even be able to get away with a stick vacuum. Want to keep your floors extra clean? Be sure to place doormats inside each entrance, so visitors don’t track dirt into the house. My Home is a Mix of Hard Floors and Carpet, What Should I Do? Looking for a vacuum that will effectively clean both hard floors and carpet can certainly be a challenge! If you are looking for one machine to clean both surfaces, you’ll want a vacuum that offers different settings for both of your needs. You’ll also want to look for a vacuum with a variety of detachable attachments. These allow you flexibility in how you clean your floors. I Have Bad Allergies – Is there a Vacuum for Me? Fortunately, there are still plenty of options of vacuums for those with allergies. Look for a vacuum with a dust free sealed system . Additionally, make sure your vacuum has a HEPA filter, as this provides the absolute best filtration and helps get rid of common allergens like dust, carpet mites, and pollen. What Can I Do about Pet Odor? You love your pet, but it would be nice if you didn’t have to smell him. Pet odor can linger in your floors and even in your vacuum. For a vacuum with a bag try to change out the bag after every use so you can minimize odor. Sprinkling the carpet with a thin layer of baking soda before vacuuming will also help get rid of the smell. Airing out the house on a nice day will also help. My Pet is Scared of Vacuums, Especially the Loud Noises. Is there Anything I Can Do? Vacuums can be scary for your pet. After all, it’s a big machine making a really big noise. Most pets will come around to the noise after time. If your pet continues to be fearful, putting him or her outside while you vacuum may help. You can also try to expose your pet to the vacuum. Put him with the vacuum while it’s off to show your pet that the vacuum isn’t the enemy. It’s possible to find the right vacuum to clean up your pet hair. There’s no reason why you can’t have a pet you and a home that is clean. By using this guide, you are sure to make the right purchase. Now go and play with your pet!